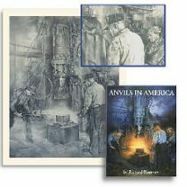 anvilfire.com IS a unique resource for blacksmiths and related metal workers. anvilfire has been answering your metalworking questions for over twenty years!. If you need answers now check anvilfire's FAQ's or ask our Guru. Anvilfire is dedicated to advancing modern blacksmithing while retaining traditional standards of craftsmanship. Additions to this site are made on a daily basis. Please see our DISCLAIMER before going any further. Beware of Internet fraud when selling on-line. A common ruse is to offer to pay more than an item's price and have the "extra" refunded or pay for shipping on a large item. A forged cashiers check is sent as payment. You are expected to cash the check and send money to the buyer OR a third party "shipper" who is in league with the crook. It can take several weeks to a month for a forged cashiers check to bounce. Then you are out your real money and in trouble with the bank and possibly the law for passing a bad check. Most of the time these buyers seem too good to be true. They ask few questions but are in a hurry to make the transaction. Seller beware! Click HERE if you need to know how to Get Started in Blacksmithing. NEW! 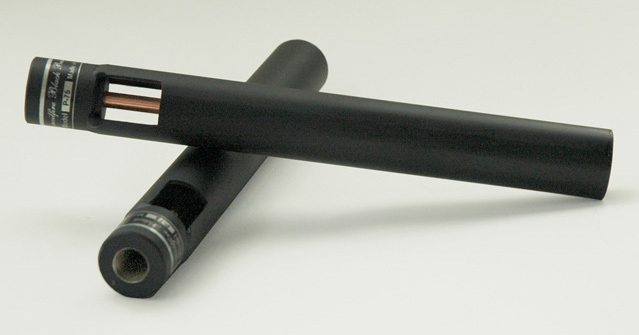 anvilfire P-75 Black Beauty Burners. More Info. . .
Everything needed to outfit a complete forge shop! Buy Sell Trade and Advertise on anvilfire! New eMarket Fleamarket for tThe BEST keeps getting better! SPECIAL! anvilfire.com feature, on-line eBooks. On the Construction of Locks and Keys, by John Chubb, 1850. More to come. . Tool Making, Locks, Professional Smithing . . .
anvilfire! is now the Host of these web-rings! 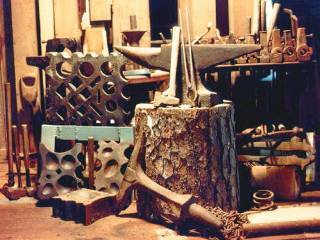 The most successful metalworking forums on the Internet. Why three forums? Each forum has a different purpose and have filled them well. It seems that different people have different preferences. Some folks are not comfortable posting in a chat, others are looking for varied opinions and prefer not to ask "the guru". Then there are those looking for factual answers without a wait, and we provide those on the guru's page. We also sponsor a private CSI members forum and the special iForge classroom. Ask a metalworking question and he or one of his helpers will answer. If he can't answer your metalworking question he will look it up or find someone else that knows the answer! Are you new to blacksmithing? The Guru loves to help you get started! Please read this before asking the Guru questions and Getting Started if you need to know where to start. The only active blacksmith chat on the net! A meeting place for Artists, Blacksmiths, Craftsmen, Welders. Looking for metalworking comrades? This is the place! Discussion topics relative to all types of metal working. There you can slake your thirst for knowledge as well as friendship. The original home of the iForge classroom. 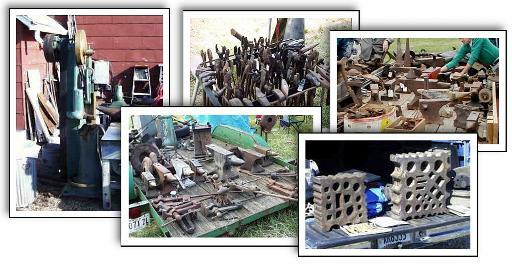 A free-for-all for blacksmiths and metalworkers to meet, swap lies, buy sell and trade tools, post notices and ask advice. We get a lot of questions about armor at anvilfire. Probably more questions about swords than any other. We are now posting armor articles and links and promise more in the near future. True blacksmith stories, historical novels, poetry, myths and legends about blacksmiths and blacksmithing. Featuring Jim "Paw-Paw" Wilson's serial The Revolutionary Blacksmith and the complete on-line version of James Nasmyth's Autobiography. Now includes Ray Smiths Metalworking Origins Notebook. English glossary with index and definitions. Metalworking term in English, French, German, Italian, Spanish and others. Find out what is going on in the world of blacksmithing, bladesmithing or armor. Enter your group's event. Interactive blacksmithing demonstrations from the Slack-Tub Pub. Includes step by step blacksmithing instructions for over 100! step by step projects! Includes safety topics and animated forging sequences. Featuring Bill Epps, James Joyce, 'Paw-Paw' Wilson, Dippy Duck and others. Produced by Andrew "Kiwi" Hooper. In depth book and video reviews. Sources for hard to find books. Now featuring Paw-Paw's Corner. Register your "touchmark" signature stamp here! Let the world know THIS is YOUR mark! anvilfire is one of the most targeted metal working market places on the Internet! Tens of thousands see our advertisers banners! Over TWENTY - SEVEN Million Served!